I’ve made something seriously delicious for you. Well, and for me. It’s Chocolate Strawberry Tiramisu for Two! Oh yes, I’m for real. 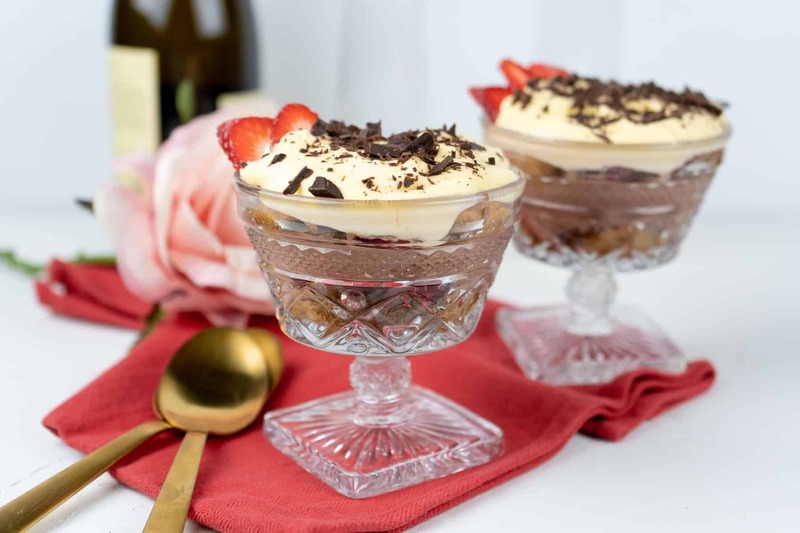 Whether you’re making plans for Valentine’s Day, a date night or just a little me time, this Chocolate Strawberry Tiramisu is decadent, easy to make and perfectly sized for two (or one… no judgement)! In full disclosure, when I dreamed up this recipe for Valentine’s Day for you and your boo (and for me and mine! ), I knew it would be good. I mean, hello… chocolate. strawberries. tiramisu. But I actually didn’t know just how super, crazy, out of this world delicious this tiramisu for two would be. Tiramisu is a classic Italian dessert (and my favorite) for a reason. It’s super delicious and a perfect end to a cozy, filling meal. Not to say that it’s light. However there’s something about the espresso/alcohol/whipped mascarpone combination that’s somehow simultaneously refreshing and decadent. A real Italian miracle. 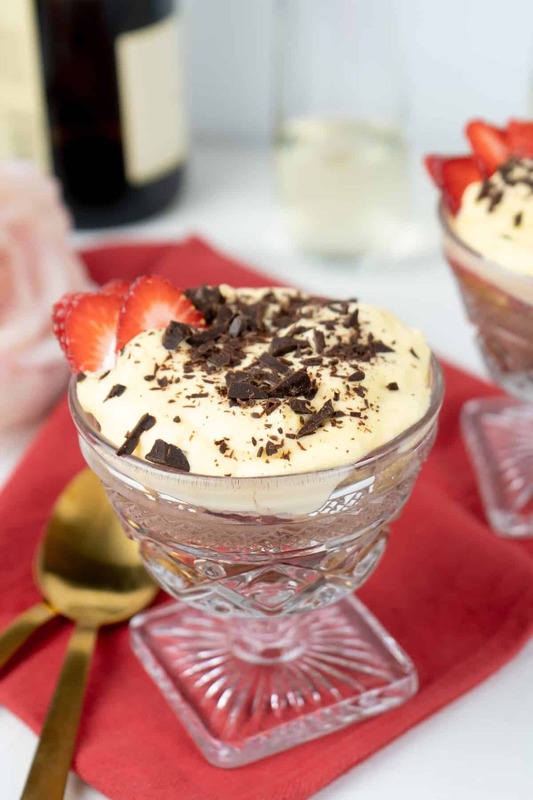 And this Chocolate Strawberry Tiramisu is a slight romantic twist on that classic Italian dessert. And shrunken down to be made Tiramisu for two. 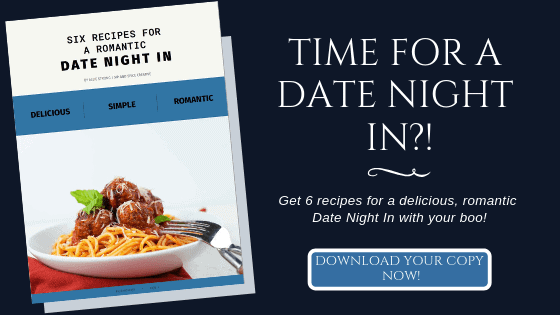 Wondering what’s for Valentine’s Day or your next date night in? 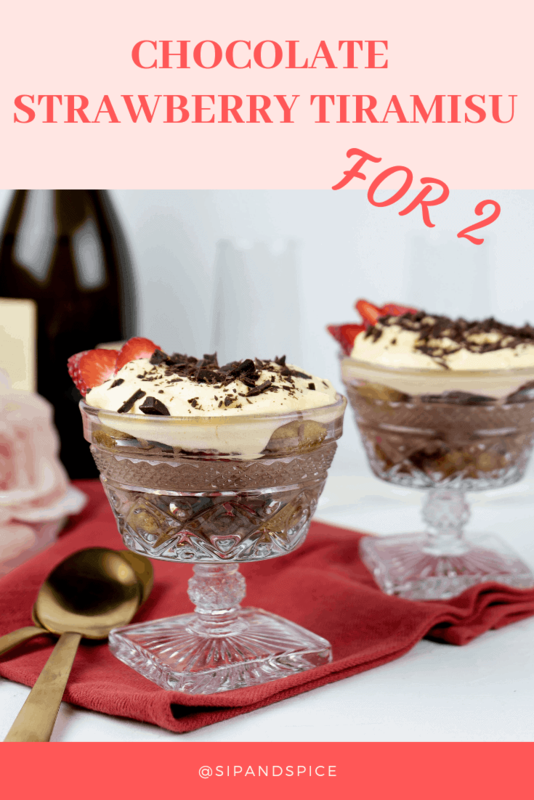 This Chocolate Strawberry Tiramisu for Two is the answer! 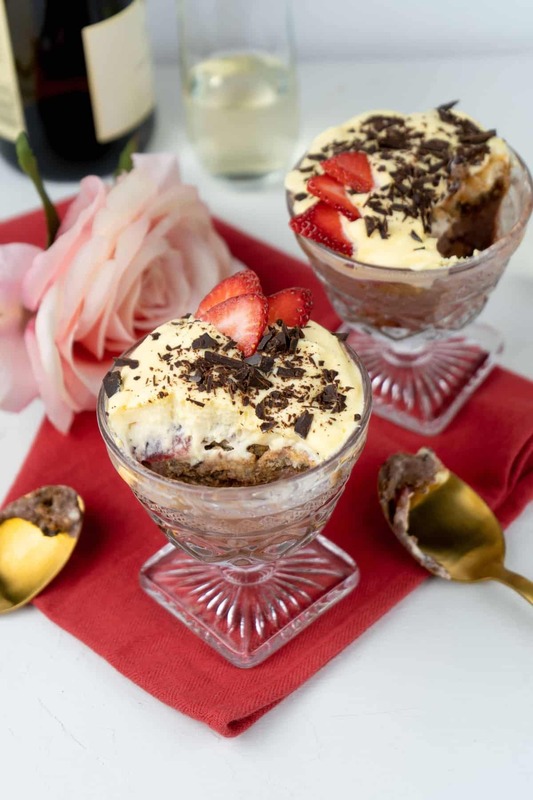 In this Chocolate Strawberry Tiramisu for Two, the addition of the chocolate starts to move this dessert to the ultra-rich, heavy side. But the fresh, lightly macerated strawberries keep it light and airy. In a small bowl, combine the strawberry slices and 1/2 tablespoon of sugar. Set aside. Brew 1/2 cup of espresso. Place in a wide bowl and set aside to let cool. Grab two medium bowls, separate the egg into them, whites in one bowl, yolk in another. Add a tablespoon of sugar to the egg white and use a hand blender to whip into stiff peaks, about 3-5 minutes. Careful not to over whip because whites will curdle after the stiff peak phase! Add the remaining tablespoon of sugar to the egg yolk and whip with the hand blender until it is a soft yellow color, about 2 minutes. Add the mascarpone and whip until fully combined, about 30 seconds (longer if mascarpone isn't yet room temperature). Grab another small bowl and separate 1/2 the yolk mixture into it. Add the cocoa powder into the small bowl and whip until combined with the yolk/mascarpone mixture. Using a spatula, carefully fold the 1/2 the stiff egg white into the plain yolk/mascarpone mixture and 1/2 into the chocolate mascarpone mixture. Add the rum to the shallow bowl with the espresso and stir together. Using two small serving dishes, start to build! First dip a ladyfinger into the espresso/rum mixture for 1-2 seconds and place in the bottom of the dish. Create 1 even layer of soaked lady fingers in each dish then top with a layer of strawberry slices and then the chocolate mascarpone. Repeat with another layer of soaked lady fingers, strawberries and then the plain mascarpone in each dish. Top each with the shredded chocolate and place in the refrigerator to set for at least 4 hours.